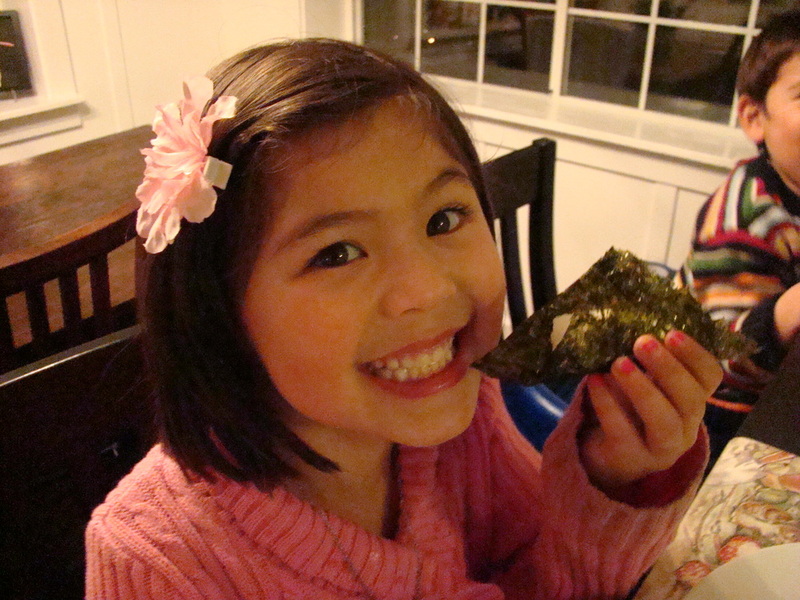 Onigiri and Roasted Seaweed, the Perfect Anytime-Snack! Making Japanese rice is not that difficult but it does require that you use Japanese rice to get the desired stickiness. Japanese rice is shorter grained and higher in starch content which gives it that sticky consistency. Japanese rice needs to be washed multiple times to purify the flavor and remove any impurities. It even comes in a healthy brown rice variety that I actually prefer. If you can't find Japanese brown rice, regular long grain brown rice from your local grocer will also work - you just have to add more water to give it the sticky consistency that Japanese rice has. If you don’t have a rice cooker, take the raw rice (anywhere from 2-3 cups depending on how much you want) and put it in a medium to large saucepan. 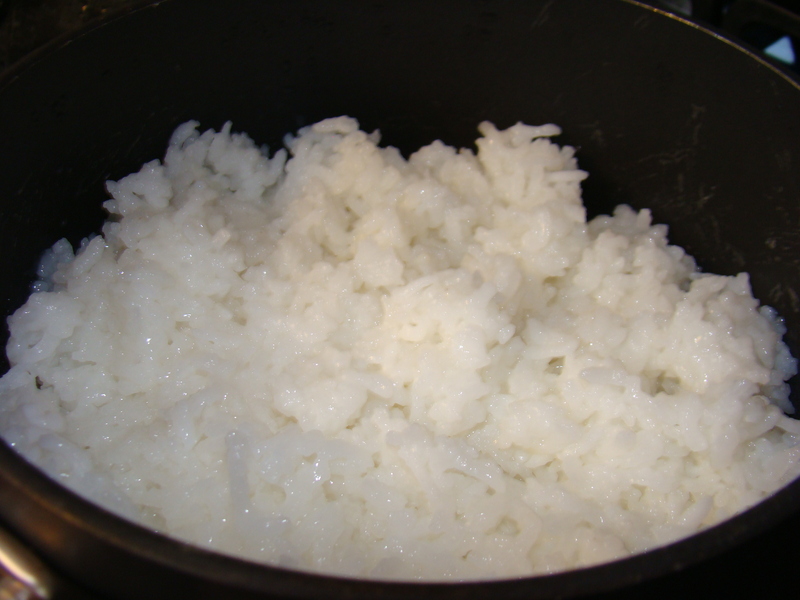 Gently rinse it with water in the sink by pouring water over the rice until it is covered by about 2 inches of water. 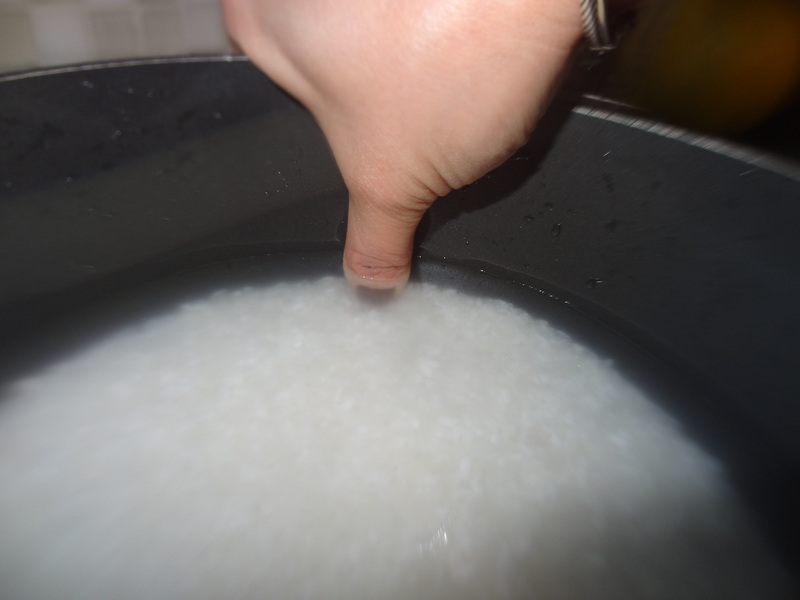 Swirl the rice and water with your hands until the water looks milky. Carefully pour out the milky water and repeat 3 times or until the water runs clear. Once the water runs clear, cover the rice with water again but do not drain. The amount of water obviously varies with the amount of rice but here’s a trick that works with any amount. Cover the rice with enough water so that when you put your thumb to the top of the rice, the water covers your thumb about an inch - don't put too much water or you'll have gummy rice. Let soak for about 15 minutes. Place the lid on the pan and start cooking the rice on high heat until the water has come to a boil. Turn the heat down to just above simmer and cook for 30 minutes (brown rice may require more cooking time). Remove from heat and let steam with the lid on for an additional 15 minutes before serving. Results should be perfect, fluffy Japanese rice every time! Alternatively, you can buy a fancy shmancy Japanese rice cooker and do all of the above except for the cooking part. You simply stick the bowl insert back into the cooker and press a button for perfect rice. Plus, these rice cookers can keep your rice warm for days! 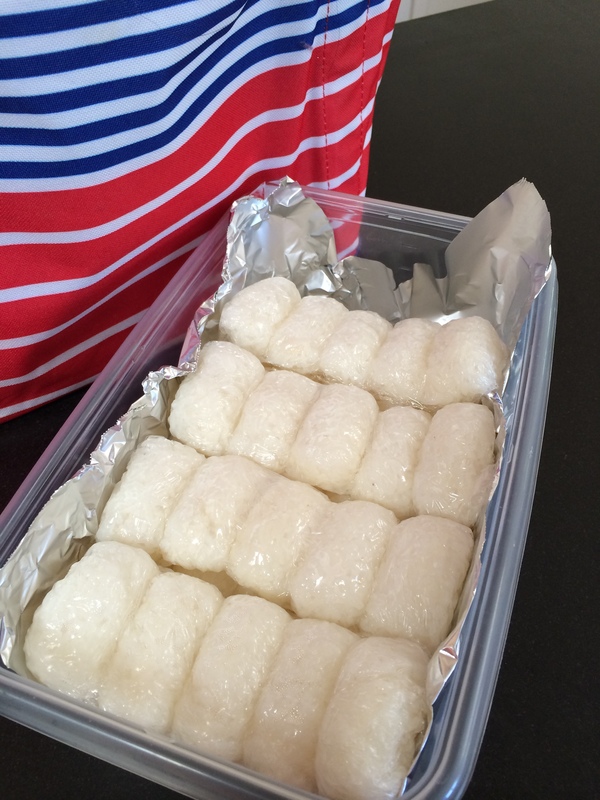 I can make about 50 individual onigiri with 3 cups of cooked rice. You can use freshly made rice or if you have left over rice, you can rehydrate it by popping it in the microwave with a wet paper towel on top to steam for about 2 minutes. I prefer the nigiri shaped mold that looks like little rectangle shapes because I don't usually fill my rice with anything, and these are bite sized. Here's a short video on how I make them. I use saran wrap on the inside of the mold so that the rice doesn't stick to it. Out pops a vacuum sealed packet of bite sized rice balls to hand out to my hungry little eaters. These days you can find roasted and flavored seaweed at every grocery store, even Costco carries them in small snack packs. I prefer to roast my own because I feel like some of the varieties out there are too oily or aren't crunchy enough for me. If you purchase a pack of seaweed made for sushi in big sheets, you can roast these over an open gas flame in seconds. If you do it this way, I promise you'll never go back to those instant packs because these are crispier, tastier and you can make much more for your money. Here's a short tutorial video on how it's done! Mix all marinade ingredients in a medium sized bowl until thoroughly incorporated or put directly into a large ziploc bag, close the bag up and shake to mix. 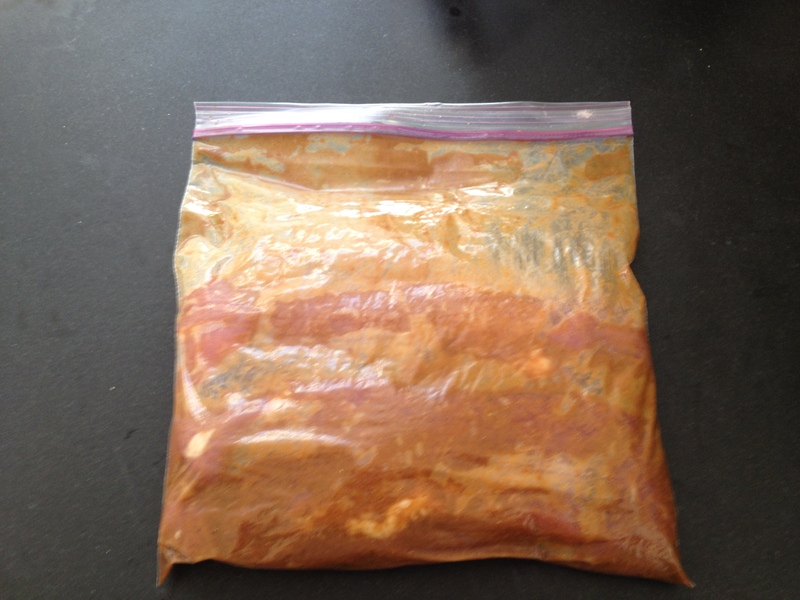 Either pour marinade into a ziploc bag and add pork loin or if you used a ziploc bag to mix, just add the pork. Let sit in refrigerator until ready. Prepare the BBQ for medium high heat to about 350 Degrees. Remove the pork from the marinade and place directly on to BBQ. Cook to medium rare on both sides. If you cover the BBQ, make sure to check it every so often for excess flaming. Remove from BBQ and cover to let rest to continue cooking so that pork is just pink. For rice, wash jasmine rice until water runs clear. Place all ingredients in a rice maker or cook on high in a medium sized sauce pan and reduce to simmer after boiling point reached. Cover for about 25-30 minutes. For bananas, slice the bananas on a diagonal about 1/4" thick. In a medium saute pan, melt about 2 tbsp of butter over medium high heat. When the butter starts to slightly brown, add the bananas. Flip them after about 1 minute until they are brown on both sides. After the pork rests, slice on the diagonal about 3/4" pieces. 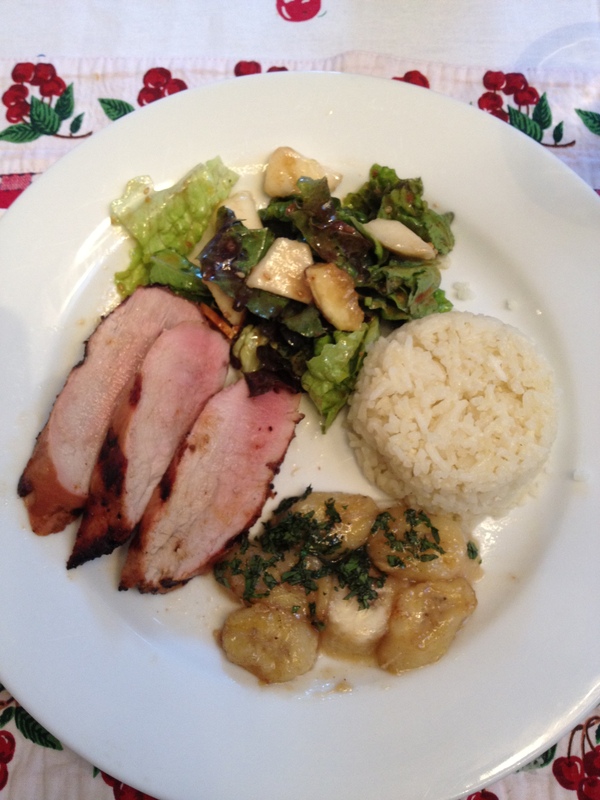 Serve with coconut rice, fried bananas and fresh coriander on the top for garnish. 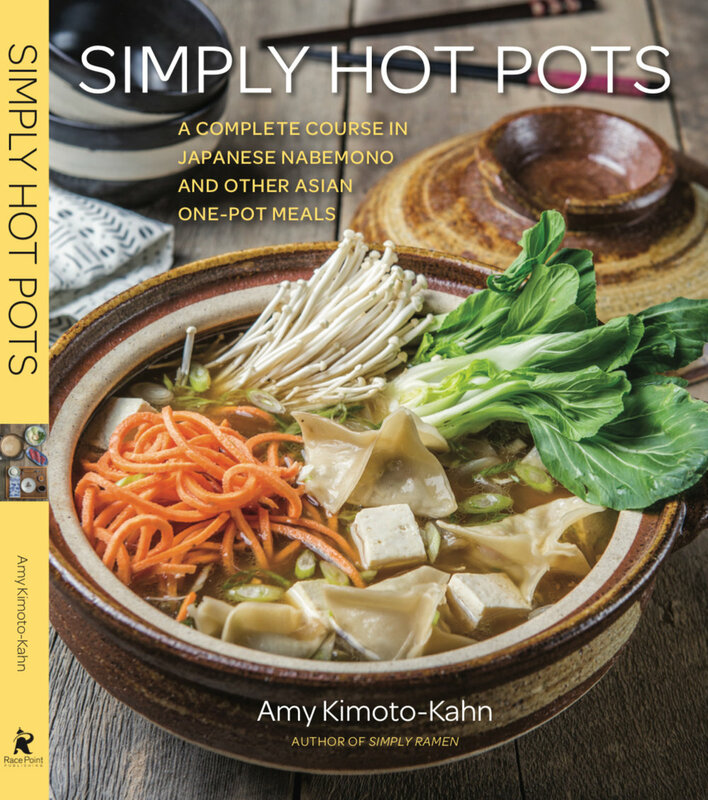 Fill your Japanese pantry with my faves! Growing up, my mom always bought certain brands of Japanese products, mostly from small Japanese markets that weren't always that close to our house. We've come a long way since exotic "sushi" was featured in the movie, "Sixteen Candles". Now Japanese food and sushi are pretty common and ingredients are fairly easy to find in your local grocery stores. I have continued to use the same brands my mom used to buy but I have also tried others. Now I know it was for a reason. I did a bit of an "America's Test Kitchen" experiment with some of these products and my mom's picks won along with a couple of new ones (where I couldn't remember what she used). Here are some great Japanese staples to stock your pantry with that will help you to get started on your Japanese cooking journey. If you don't have a Japanese or Asian market near you, Marukai has a great e-store where you can find everything and it's fun to look around! http://www.marukaiestore.com/ No excuses now! 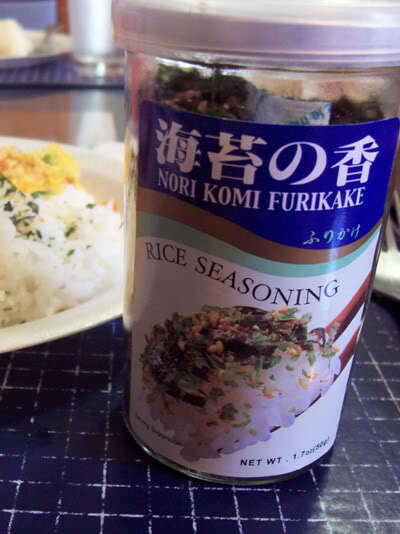 Furikake- (ふりかけ) – A condiment normally used to sprinkle on top of rice and usually contains a mixture of dried and ground fish, sesame seeds, and seaweed, sugar, and salt. Yes, ground fish, but the kids can’t tell, I promise! The brand name isn't on the front of the jar but on the back - made by JFC International. Not available in most grocery stores but will be in an Asian or Japanese market. Gohan (ご飯、ごはん) – Japanese rice. Best cooked in a Japanese rice maker but can be done simply in a pot on the stove as well. 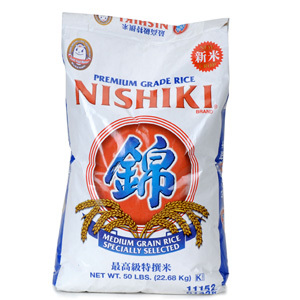 My family has always used Nishiki and it always comes out fluffy and moist. There are more expensive brands out there but this one is a pantry staple. Available in most grocery stores. Mirin(みりん) – Sweetened rice wine. Used to make teriyaki sauce and for marinades and dressing in replacement of sugar. Although this does contain low amounts of alcohol, it is safe for use in children’s dishes as there is normally a very small amount added. 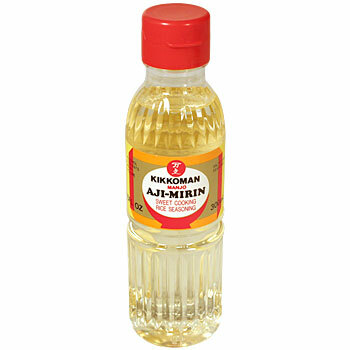 Kikkoman makes the best Mirin - not to be confused with rice vinegar and cannot be interchanged! Available in most grocery stores. Miso (味噌、みそ) – Fermented soybean paste. Most common types are red miso (used in salad dressings and soups) and white miso (used in marinades). 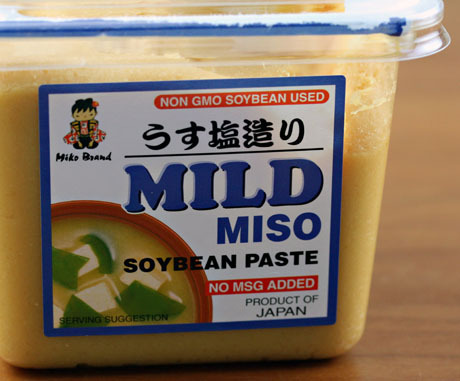 Miso paste should be refrigerated and stored in an air tight container. I like the Miko Brand because it doesn't have any GMO's in it. Not available in most grocery stores but will be in an Asian or Japanese market. Ocha (お茶、おちゃ) – Japanese green tea. I have a bias towards Japanese tea vs. other Asian teas. I like the nuttiness of Japanese tea and a good tea has a very soothing and aromatic smell. 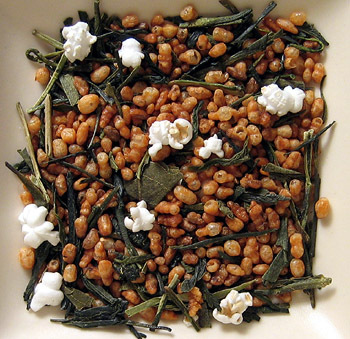 My favorite variety is Genmaicha and it is distinct from others in that it has tiny little popped corn pieces in it. 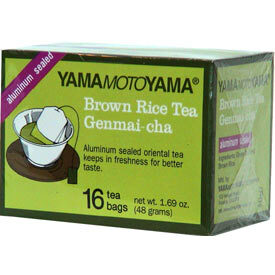 YamamotoYama makes a good brand of tea that you might be able to find in a grocery store but if you can purchase Genmaicha from a Japanese store, then any of the Japanese brands are great. 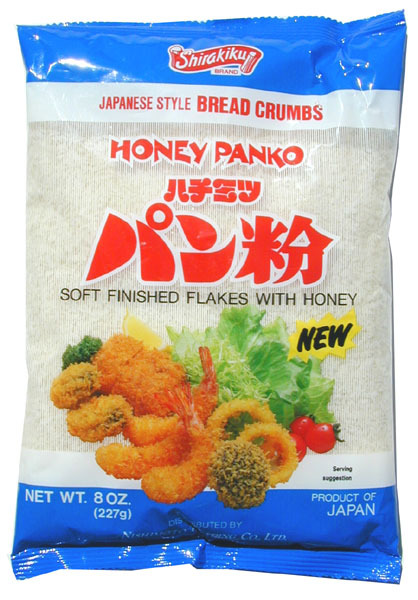 Panko (パン粉、パンコ) – Prepared Bread Crumbs. Most often used to coat a pork cutlet in tonkatsu (豚カツ、とんかつ) which is traditionally deep fried. It doesn’t have to be deep fried - you can broil it and it comes out just as crispy without the oil! I like the Shirakiku brand more than the organic home made varieties you find in upscale specialty stores. It's light and flaky! Available in most grocery stores. Sesame Oil - I don't even know the Japanese name for sesame oil because growing up, we didn't call it by it's Japanese name, we just called it sesame oil. But this brand Kadoya is the best by far! I've tried others and they are either too oily or don't taste like strong sesame. This one is better because you don't need much to season anything, it's strong flavor and thick consistency allow you to use very little to get that sesame taste. Great in dressings, on fish or drizzled on top of steamed broccoli. It's a Japanese pantry must-have! Not available in most grocery stores but will be in an Asian or Japanese market. It will be worth it, I promise! 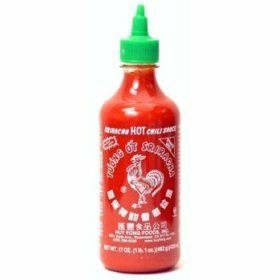 Sriracha Sauce - This is actually Thai hot sauce so it's not even Japanese but most sushi bars use this sauce in their spicy tuna. It's a staple in our house when we have sushi parties and make our own spicy tuna (the recipe is in my blog "just roll with it"). The red rooster brand is THE only brand to get. I've seen it at grocery stores but most Asian grocery stores carry it as well. Shoyu (醤油、しょうゆ,) – Soy Sauce. Available in light and dark varieties and salt content. Japanese soy sauce has a milder flavor than Chinese soy sauce. All the recipes in this cookbook call for the low sodium light variety that is available everywhere. Pronounced like I'll "show you". I've stuck to Kikkoman for years and like that they have the low sodium variety because it's still salty! I also buy this big ole gallon size because I use it all the time to make teriyaki sauce and it has a very long shelf life. They sell it in smaller bottles and you can find it in most grocery stores. Su (米酢 komezu, "rice vinegar" or simply 酢 su, "vinegar") - Japanese rice vinegar is very mild and mellow and ranges in color from colorless to pale yellow. It is made from either rice or sake lees. These vinegars are used in making sunomono (酢の物, "vinegar dishes"), tsukemono (漬物, "pickles"), nimono (煮物, "simmered dishes"), as well as in marinades and helps things to not smell fishy! Marukan makes the best Rice Vinegar and it can be found in most grocery stores. Tofu(豆腐、とうふ,) – Soybean Curd that comes in several varieties. It has little to no flavor but is great in soups or eaten like a steak. Plus it’s full of protein! 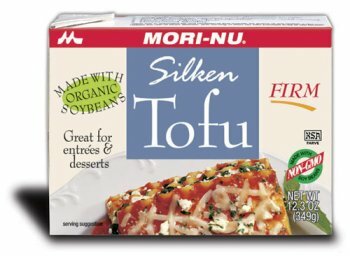 I'll admit, I'm not a big tofu user so I wouldn't consider myself the expert on this one but I do like this brand because it's organic and available at most grocery stores. Plus I like that it's actually made by a Japanese company. If you know of a better one, let me know! Wasabi(山葵、わさび) – Japanese horseradish. You probably won’t use this much in the kid’s recipes but you never know, your kid may like spicy stuff! Not too be confused with guacamole!! This can be found in most grocery stores in the Asian section. I prefer it to the powdered kind because then you don't have to mix with water and the consistency is just right. The brand is S&B. Have you ever tried wasabi mashed potatoes? Those are awesome! Just roll with it, it's a sushi party for everyone! I've got three kids so "just roll with it" is a motto that I have to live by. In keeping with this motto, I thought I'd post a super easy way to make and eat Japanese hand- rolls! The great part about this recipe is that you can roll up pretty much anything. My kids like plain rice but if I want them to eat their veggies or try different types of fish, they'll happily roll it right up. 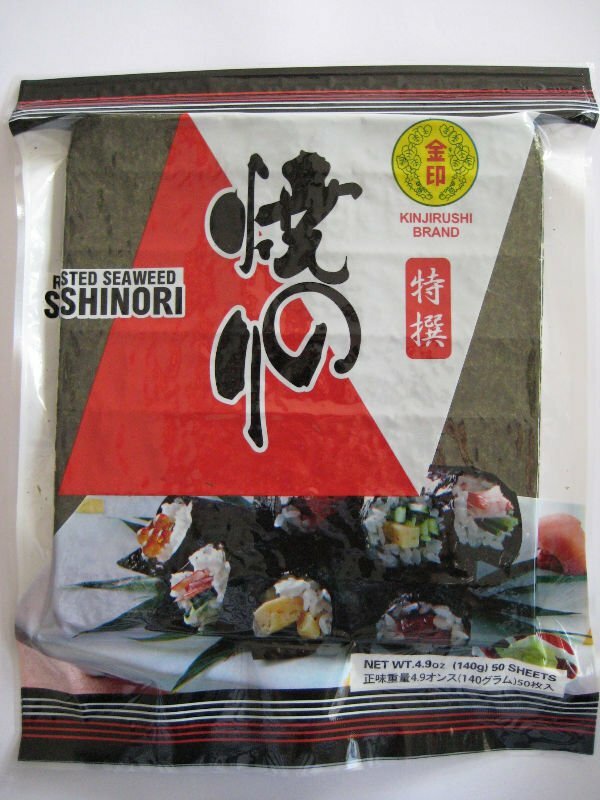 Anything tastes better in a crispy piece of seaweed (nori)! What makes this recipe different is how you prepare the nori. 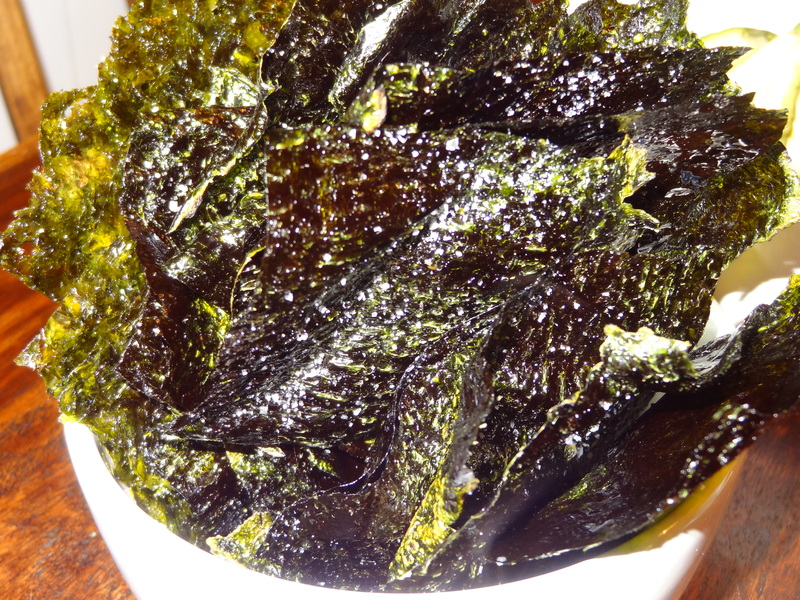 Seasoned, crispy nori has become very popular these days. You can find it in little snack packs all over the place but I've been making it at home since I was little. You can easily roast it on a gas stove and it comes out crispier, fresher tasting, less oily and better for you! I'll show you how to make it below. To start your sushi party, you'll need to start with making Basic Japanese Steamed Rice. Japanese rice is shorter grained and higher in starch content, which gives it that signature sticky consistency. It comes in healthy brown rice varieties and a delicious in-between variety called haiga rice. When looking at the different types, remember that the higher quality of rice you purchase, the better it will taste. If you are at an Asian or Japanese grocery store, you’ll see a range of rices to choose from, so try a few different brands out and experiment. All Japanese rice needs to be washed multiple times to improve the flavor and remove any impurities. My method for cooking is one that I know is familiar to many Japanese families but may seem a bit unconventional. We don’t measure the water with a cup, we measure it with our thumb! Results should be perfect, fluffy Japanese rice every time. 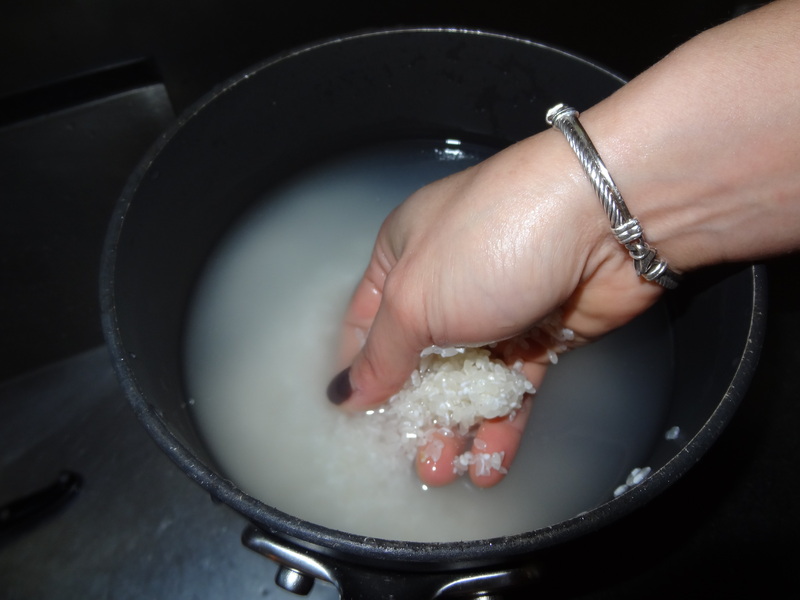 Place the rice in a 4 qt saucepan or use the bowl of a rice maker, and gently rinse the rice by swirling your hands through it and rubbing the rice grains together in your palm so that all of the starches are released. Carefully drain the milky water, repeating 4-6 times until the water runs almost clear. Pat the rice down so that it is evenly distributed and cover the rice with enough water so that when you put your thumb to the top of the rice, the water rises up to the knuckle on your thumb - about 1 inch high. Regardless of how much rice you use, this trick will work with any amount. Let the rice soak for about 15 minutes. If cooking in a rice maker, follow the instructions on your device. If cooking on the stove, heat the rice until the water comes to a boil. Turn down the heat to just above a simmer, cover and cook for 30 minutes (brown rice requires an additional 10 minutes). Remove from the heat, do not remove the lid and let the rice steam for an additional 15 minutes before serving. In a small bowl, whisk together vinegar, sugar and salt. Immediately after the rice is cooked and while it is still warm, put it into a large bowl and pour the vinegar mixture over the rice while folding it in until it is combined. Some people like to fan the sushi rice while you are mixing so that the rice has a nice glossy sheen. If you don’t have time, don’t worry, you don’t have to season it – just serve the rice plain. Makes about 40 individual hand-rolls - or cut down on amount of rice and toppings if you aren't having a party! Many of these ingredients can be prepped ahead of time so you can have time to relax. It’s delicious, easy, and fun. Everyone gets involved and it's a crowd pleaser too because your guests can make exactly what they like. If you're making it for kids, just tell them the wasabi is not guacamole! Pour sesame oil into a small bowl. Lay each piece of toasted seaweed on a paper towel and sprinkle with salt. Repeat and stack. When done, take kitchen shears and cut the sheets into fourths. 1/2 pound ahi tuna (does not need to be sushi grade) - freeze ahead of time to make easier to cut and make more uniform pieces. Take frozen tuna and let rest for 15 minutes. Cut the tuna into 1/8" cubes. If you see any sinuous white bits, remove. In a large bowl, combine the tuna, sesame oil, chili oil and sriracha sauce. Right before serving, add the kosher salt and combine so that guests can still get a little crunch from the salt. Get ready to have a sushi party! Right before your guests arrive, lay out the sushi rice, toppings, and toasted seaweed in separate bowls. Have the condiments (sesame seeds, soy sauce, wasabi and ginger) in smaller bowls with serving utensils. I make a separate bowl of soy sauce and wasabi already mixed so that people can just spoon it on if they like. Don't worry about the rice being warm - it's better at room temperature because it won't make the seaweed rolls soggy. Have guests take a square of nori and spread a small amount of rice in the center and top with desired toppings. They can continue to gather round and make their own sushi hand-rolls - like a Japanese sushi taco party! Need a video tutorial - it's all right here!